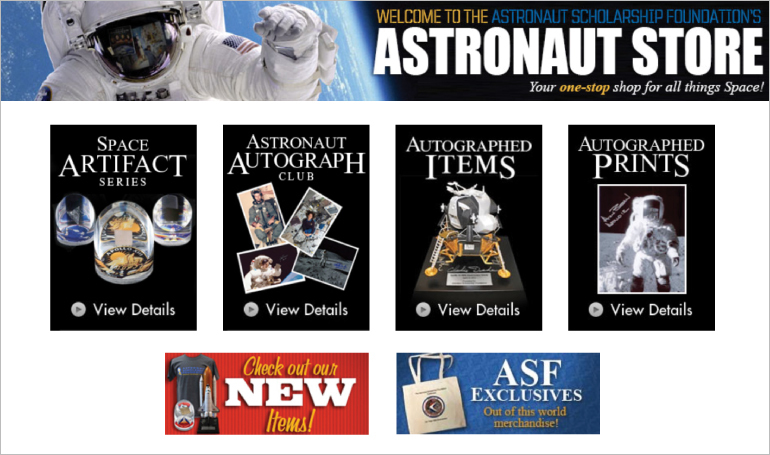 The Astronaut Scholarship Foundation is proud to offer more than 150 authentic, astronaut autographed items for the space enthusiast in you. Explore the ASF online store to find one-of-a-kind autographed commemorative space flight photos from Mercury, Gemini, Apollo, and Skylab programs to Space Shuttle models signed by veteran shuttle commanders and even memberships to the exclusive, unique Astronaut Autograph Club and more! The ASF is the prime source for authentic, astronaut autographs, straight from the space legends themselves. Store proceeds benefit the Astronaut Scholarship Foundation which is a 501(c)3 non-profit organization, that provides annually more than 40 scholarships to the brightest and most talented college students in science, technology, engineering and mathematics.